I had nothing to do with selecting the winners. I just handed you the clues on a silver platter, especially that last video where I say Honduras several times. The good folks at Wiley, my publisher, just emailed me the names of the randomly selected winners. The grandprize winner of the HD flipcam and Frommer’s guides is Melissa Markofski, a longtime follower of my blogging exploits. Congrats Melissa! The runner-up winners of Frommer’s guides are Phillip Bohning and Simon Tatum. Yes, the Simon Tatum of film-making fame. After 8 weeks of clues and guesses it’s time to reveal where in the World I was…. 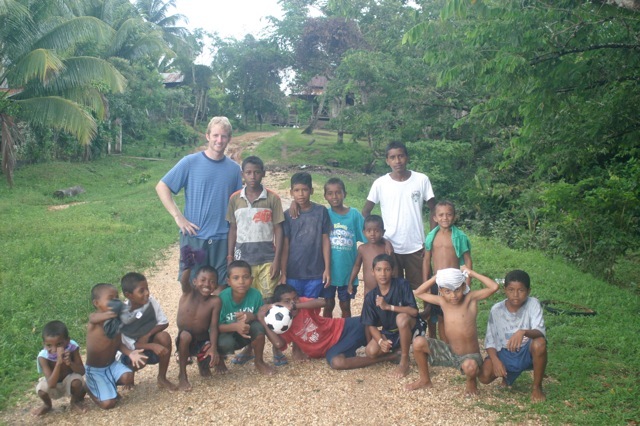 I visited Honduras in 2005 on what was to become the first leg of my “Where Am I Wearing?” adventure. 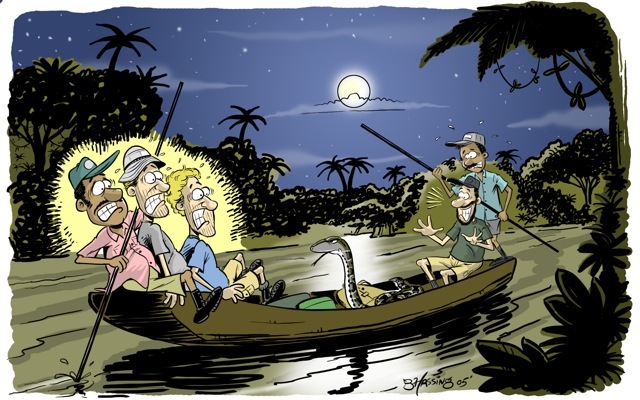 I spent a lot of my time on the Mosquito Coast trying not to be killed by crazy biologists and deadly venomous snakes, playing soccer on a sandbar, and teaching an island village the game of baseball. In general, other than my brother coming down with malaria I had a lovely time in Honduras and met some great people. This is it, the last clue. I’m joined by my brother Kyle who accompanied me to the country you need to guess. After I give the clue (the country in question is where my T-shirt was made) Kyle shares with us what it’s like to contract malaria in _____ and come down with it in France. 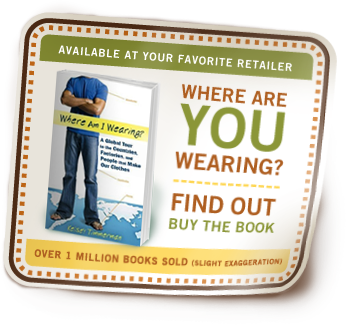 And if you’re not sure where my T-shirt was made, all you have to do is read this sample from “Where Am I Wearing?” (PDF) to find out. Wearing my favorite T-shirt in front of the factory (in the country you need to guess) that I write about in Part I of my book “Where Am I Wearing?” My wife hates my hair this long. Apparently so did the security guards at the factory. Next Wednesday I’ll post the final video clue in which I’ll talk about my factory visit. (Warning sponsor and self-pimpage!) Hey and if you’re looking for something to spend all those bookstore gift cards on you could do worse than a host of Frommer’s guides and of course a copy or 10 of Where Am I Wearing? Another video clue in the Where is Kelsey? contest. Could one of these kids be the next Julio Cesar De Leon? Special Thanks to Frommer’s for helping support and promote this contest!